Miraculin is an amazing substance which makes sour foods taste sweet. It is a protein which is present in the so called 'Miracle Fruit' from West Africa. It is not actually a sweetener on its own, but it alters the taste buds for a period of time. When the berries are chewed they coat the tongue and bind to the receptors that react to sweet substances. The resultant change in taste perception lasts from fifteen minutes to over an hour. It has the potential to sweeten sodas, ice lollies etc. 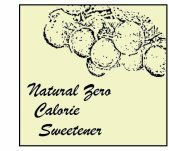 However it works very differently from other sweeteners and it's potential has not fully been explored. It is a natural product, contains practically no calories and has a zero glycemic index. It is suitable for diabetics. Has not achieved significant commercial usage yet. One restaurant in Japan, The Miracle Fruits Cafe, offers diners low calorie desserts, 'sweetened' with miracle fruit. A stumbling block is the fact that it has not yet been approved in the USA. Freeze dried berries, or tablets containing extract are available online and are sold mainly for their novelty value. It has the potential to make unpleasant tasting substances, such as medicine, palatable. This could be very useful for children. In addition it has been used to assist cancer patients undergoing treatment. Chemotherapy medication can sometimes have the unpleasant side effect of making food taste metallic. Miraculin has been used, with some success, to relieve this side effect, and help patients to overcome a loss of appetite during a period when they need nutrition. Tests are continuing. No known concerns. Has been consumed by natives in West Africa for hundreds of years. It comes from the fleshy part of the Miracle Fruit Berry. Freeze dried berries, tablets or granules. Miracle food parties have become popular. Known as flavor tripping parties a range of sour fruit, pickles etc are provided. The berries, or dried tablets, are consumed and the sour foods tasted. Supposed to be very entertaining, especially if alcohol is consumed! New understanding of the mechanism by which the protein reacts in the presence of acid in the mouth may lead to the development of new and safer types of artificial sweeteners. Does not have GRAS approval in the USA, has novel food status in the EU. Approved in Japan and some other countries. Useful natural substance with potential. Great novelty value. Is useful for diabetics and it is harmless to teeth. Almost certainly will have applications in the future.